Stargate - Empire at War: Pegasus Chronicles is a total conversion for the fantastic game Star Wars - Empire at War: Forces of corruption. 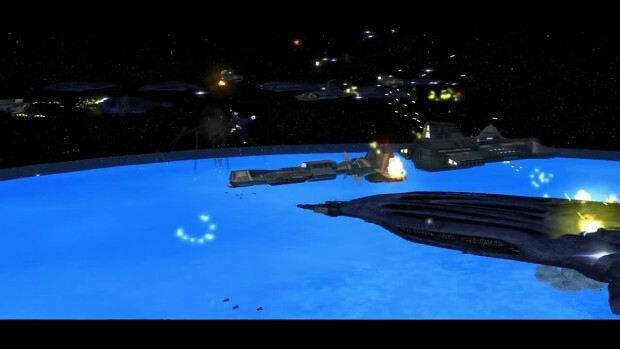 This total conversion will replace every single Star Wars asset of the original game with Stargate assets. This includes units, buildings, icons, sounds, videos and so much more. Pegasus Chronicles offers 3 playable races, the Ta'uri (alliance between Earth and the Asgard), Anubis (a mighty systemlord) and the Wraith. Beside these 3 playable races, you will meet many non-playable ones like the Replicators, the Asurans, the systemlord alliance, the Aschen, the Ori and many more. Each faction will have several space and land units, well known from the series or completely new ones. Contrary to our first full version for the normal Empire at War, the next release will offer finished GC maps, in which you can play through the known Stargate storylines and experience a lot of never seen missions and adventures. Here before it even processed! T-Minus 10 seconds till process! So no ground combat yet? Our first galactic conquest map Pegasus Prelude will be released to the stable version of our mod on 10th of March 2019!